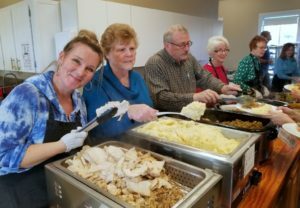 Come out to the Swauk-Teanaway Grange for our annual Community Christmas Dinner at 1:00 pm on Sunday, December 2, 2018. Community members are asked to bring a side dish to add to our Roast Turkey & Gravy, Mashed Potatoes, and Stuffing. Grange Members will provide dessert. The Mountain Voices Community Christmas Choir will perform at 1:00 pm followed by the turkey dinner. We will be accepting donations of non-perishable food bank items or children’s or holiday gifts for the local Christmas basket programs for those in economic distress. The food will be delicious; the music will get you into the holiday spirit, and the sense of community absolutely wonderful!